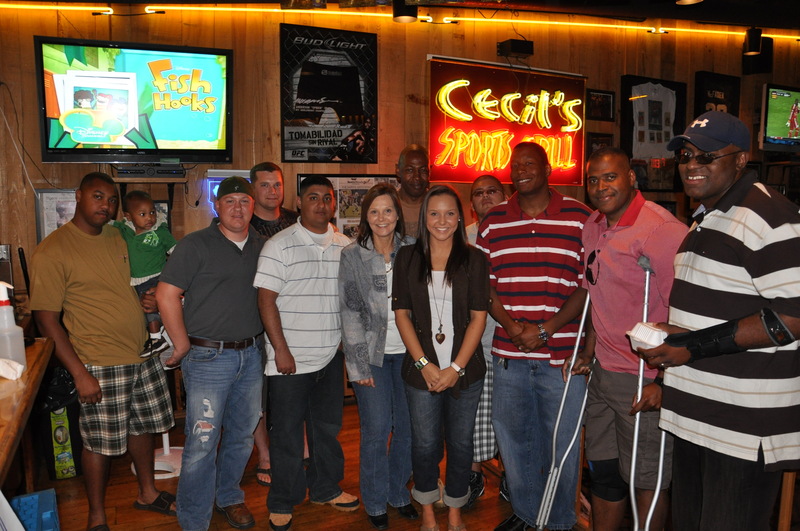 On October 21, Freedom Alliance hosted a Troop Appreciation Dinner for 35 service members and their families at Cecil’s, a popular Cajun cuisine restaurant in Deridder, Louisiana. Attendees comprised of both Army soldiers and National Guardsmen who were injured in deployments or training and are recovering at Fort Polk Warrior Transition Unit. Freedom Alliance scholarship recipient Kristy Dowdy, a native of Deridder, joined the Soldiers of Fort Polk with her family. Kristy’s father, First Sergeant Robert Dowdy, was killed in March 2003 in Iraq when his convoy was ambushed. “The Scholarship Fund helped me achieve my goals of graduating from college and it was great to see Freedom Alliance helping troops in a different capacity,” Dowdy told Freedom Alliance. Dowdy, who recently graduated from Louisiana Technical College, found out that day that she passed the Louisiana State Board exam for Practical Nursing. Freedom Alliance regularly hosts Troop Appreciation Dinners for military personnel around the country to honor and thank them for their service and sacrifice. The dinners also afford an opportunity for our troops to enjoy time out with their friends, families and comrades an important part of the recovery process.